Habit: Annual, perennial herb. Stem: ascending to erect, (3)5--10 dm, generally glabrous. Leaf: ligule 1--3 mm; blade 4--30 cm, (1) 2--5 (6) mm wide. Inflorescence: 3--30 cm, spike-like (sometimes panicle-like, branches spike-like, spreading). Spikelet: 5--22 mm; glume < rest of spikelet, 3.5--15 mm, lance-linear; lemma 3.5--9 mm, +- lanceolate, firmly membranous, awn 0--8 mm. Chromosomes: 2n=14. Ecology: Dry to moist disturbed sites, abandoned fields; Elevation: < 1000 m. Bioregional Distribution: CA-FP, DMtns (Panamint Range); Distribution Outside California: to Alaska, eastern North America; native to Europe. 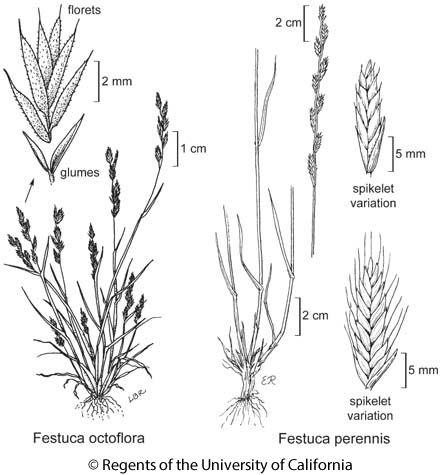 Flowering Time: May--Sep Note: Because awned and awnless spikelets can occur on same pl, and variation in stature, spikelet size, duration appear related to environmental stress, these taxa are not recognized. Citation for this treatment: James P. Smith, Jr. & Susan G. Aiken 2012, Festuca perennis, in Jepson Flora Project (eds.) Jepson eFlora, http://ucjeps.berkeley.edu/eflora/eflora_display.php?tid=91964, accessed on April 26, 2019. CA-FP, DMtns (Panamint Range); Markers link to CCH specimen records. Yellow markers indicate records that may provide evidence for eFlora range revision or may have georeferencing or identification issues. Purple markers indicate specimens collected from a garden, greenhouse, or other non-wild location.